“A Church of Mercy and Hope: Pope Francis and the New Evangelization” in Pope Francis and the Event of Encounter, ed. John Cavadini and Donald Wallenfang (Pickwick, 2018), 1-16. Gods, Heroes, and Ancestors: An Interreligious Encounter in Eighteenth-Century Vietnam, Oxford University Press, 2017. 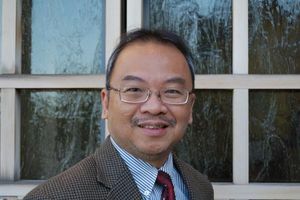 With Jonathan Tan, World Christianity: Perspectives and Insights, Orbis, 2016. “Jesus Beyond the West: Christological Conversations in World Christianity” in Jonathan Y. Tan and Anh Q Tran, eds., World Christianity and Global Theologizing: Perspectives and Insights (Orbis Books, 2016), 182-203. "Jesuit Contribution to Vietnamese Education: Past and Present" in Education For New Times: Revisiting Pedagogical Models In The Jesuit Tradition, Ricci Institute, 2014. "Inculturation, Mission, and Dialogue in Vietnam: The Conference of Representatives of Four Religions" in Beyond Conversion and Syncretism: Indigenous Encounters with Missionary Christianity, 1800-2000, Berghahn Books, 2012.